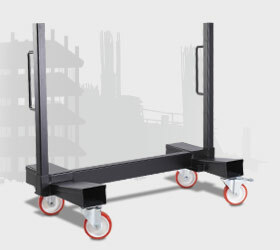 Welcome to the LoadAll range, the material handling trolleys particularly focused on transporting plasterboard and other large sheets of materials. Below is a brief overview of each LoadAll, every one unique in design with the main difference being the safe working load (SWL) of the trolley. Built to the Armorgard standard, our LoadAll range is unbeatable. Transporting large sheets of board has never been easier. Specially designed for storing and transporting plasterboard and other large-sheet materials, LoadAll™ LA750 is the only trolley of its kind on the UK market that is easy to manoeuvre through doorways and turn the corner at the same time when loaded up with material, all because of its unique design. The LA750 has an SWL capacity of 750kg. 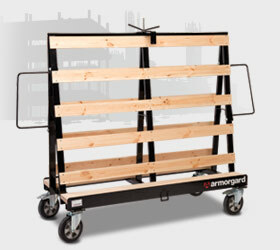 Save space, ease handling and protect your materials from damage using Armorgard’s LoadAll™ LA1000. Whether in the yard, on the delivery truck or on site, transporting large sheets of board has never been easier. Specially designed for storing and transporting plasterboard and other large-sheet materials, LoadAll™ LA1000 is the only trolley of its kind on the UK market that can be folded down and stacked when not in use – and with no detachable parts to lose! The LA1000 has an SWL capacity of 1 tonne. The new addition to the LoadAll range is the LA1500 – the LoadAll with the highest Safe Working Load (SWL) currently in the range. This robust material handling trolley is fully welded and heavy-duty construction, complete with all swivel 200mm diameter wheels to make manoeuvring easy. Easy grab handles improve the functionality of the unit, along with the quick and easy clamping system to secure boards whilst in transit. 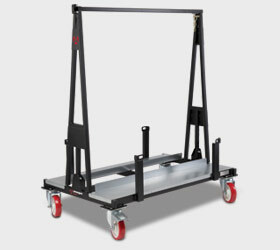 This user friendly material handling trolley has an SWL capacity of 1.5 tonne. Here at Armorgard we are pleased to introduce three new innovative products: V-Kart - for easy manoeuvring of pipe, steel and other lengths of materials. Loadall – for stress-free.